Offers: Discounts available to groups of 8 or more golfer. Modern clubhouse with bar, catering, function room & professional shop. Golf practice facilities. Stanton on the Wolds, established in 1906, is a popular and friendly club where visitors are always welcome. The course is an enjoyable and scenic parkland course with two distinct nines. The first nine holes are shorter and offer the chance to build a good score. The back nine is longer, harder and more undulating. In spite of offering a number of birdie opportunities for the better player, the small greens throughout the course require you to play accurate iron shots. 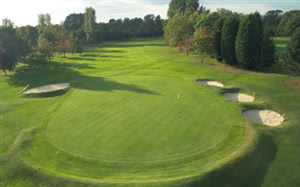 The course has a reputation of being in excellent condition throughout the year and offers a challenge to all standards of golfer. I have been a member of Stanton for over 40 years and every year the quality of the course gets better and better. It is one of the only golf clubs in Nottinghamshire that still has a waiting list for membership. It is a traditional parkland course and although relatively short by today's standards demands great accuracy in order to score well. The greens are simply superb especially from mid May through to end October. If you have a chance to play it late May to early June you would think you were putting on a smooth but undulating snooker table. It has a par of 73 but sss of 71. If you want an enjoyable day's golf you cannot go far wrong by booking a day here.